In celebration of World Animal Day I am happy to join my fellow Bento Bloggers & Friends on an animal themed blog hop. Each blog is featuring a different animal themed lunch. Of course I choose lambs. I am excited that this is my first time using EasyLunchboxes. 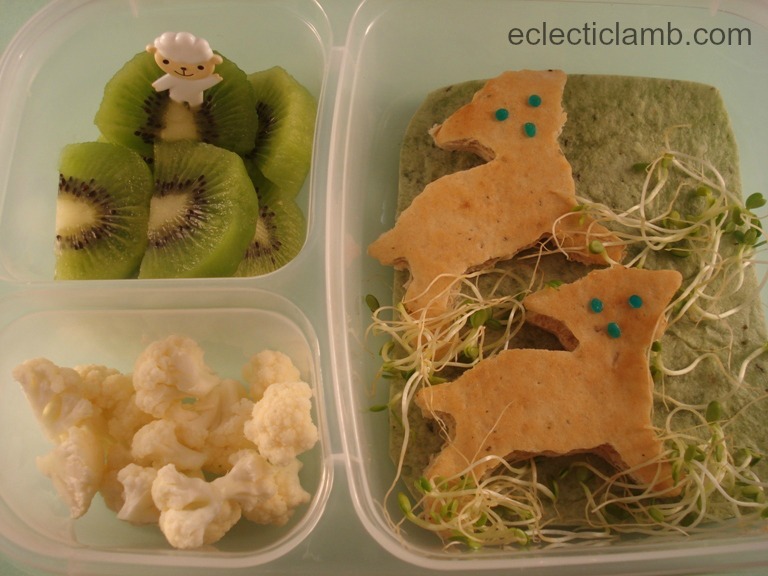 My lamb themed bento is a quick and easy lunch to prepare. Click on the button below to continue on the hop and to Sarah’s (More than your average Mom) awesome Owl lunch. This entry was posted in Bento / Cute Food and tagged EasyLunchboxes, lamb, sheep. Bookmark the permalink. Aww, they are adorable and I love the alfalfa accents! Great lunch 🙂 Love the adorabl little lamb pick too. I love the lamb and the alfalfa grass is a great idea!!! So cute! Look at the little lamb pick! Love the use of cauliflower,something new to try for me, wouldn’t have thought of putting it in a lunchbox. Yum! Love the lambs.. cauliflower was a great touch! Awww sweet little lambs! Great job! I love the srouts grass idea and it is so cute! How appropriate for your name!!! The cauliflower is so smart! Very cute lunch! Oh this is too adorable! Great job! Love it! The wool cauliflower and the grass sprout made your lunch an excellent touch. Very cute. I should have guessed that you would pick lamb! Aww what cute little lambs 🙂 Great job! Aw, such a sweet lamb bento! So cute! I am using our ELB tomorrow for the first time! p.s. Thanks for linking up with I Heart Lunch!